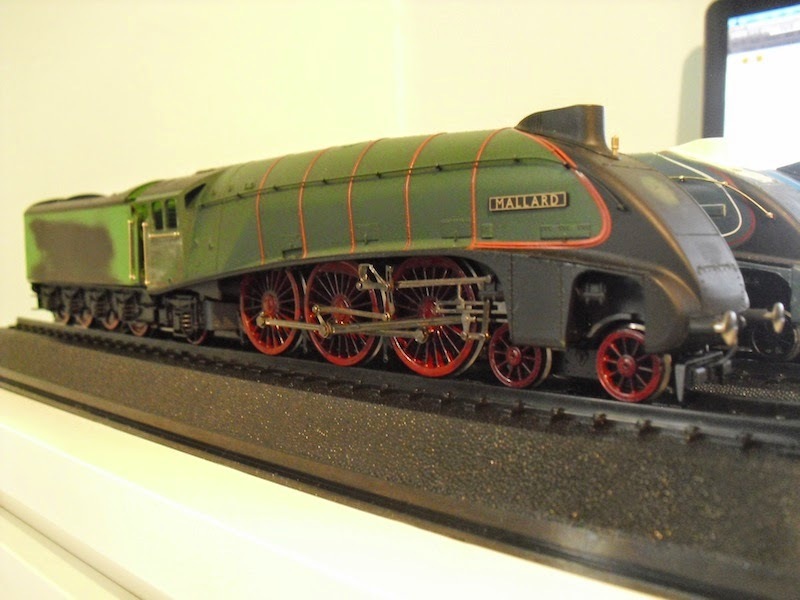 THE BRITISH RAILWAY STORIES LTD: "Mallard"
I have spent an inordinate amount of time, effort and some (budgeted) money on building up a few prototypes of A4 Pacific models to help myself develop my modelling more, and to provide a clear cut way of making the locomotives I want for my future layout. 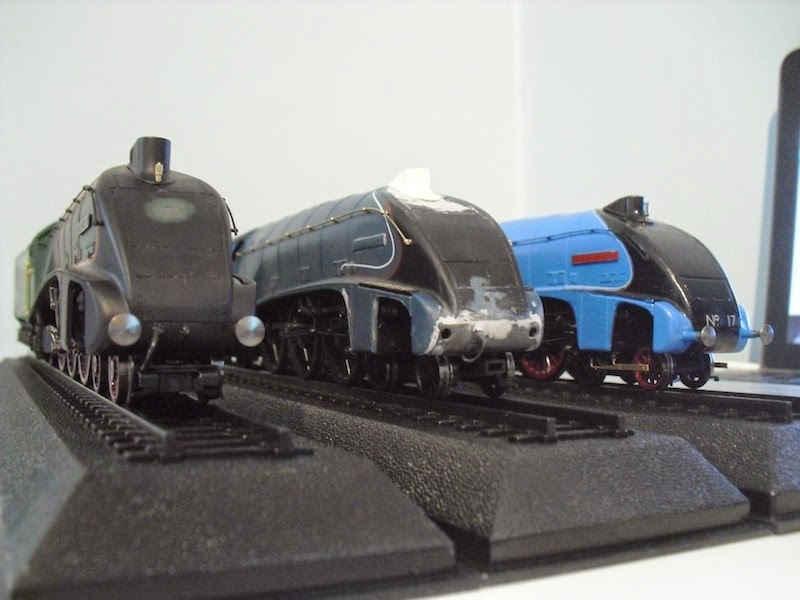 One locomotive I plan on having is Mallard, and to be frank given my previous (extremely flawed) attempt at making the speed record holder (seen above) I need to make the next one look the part on a number of levels. So, to our third prototype in the A4 conversion story. 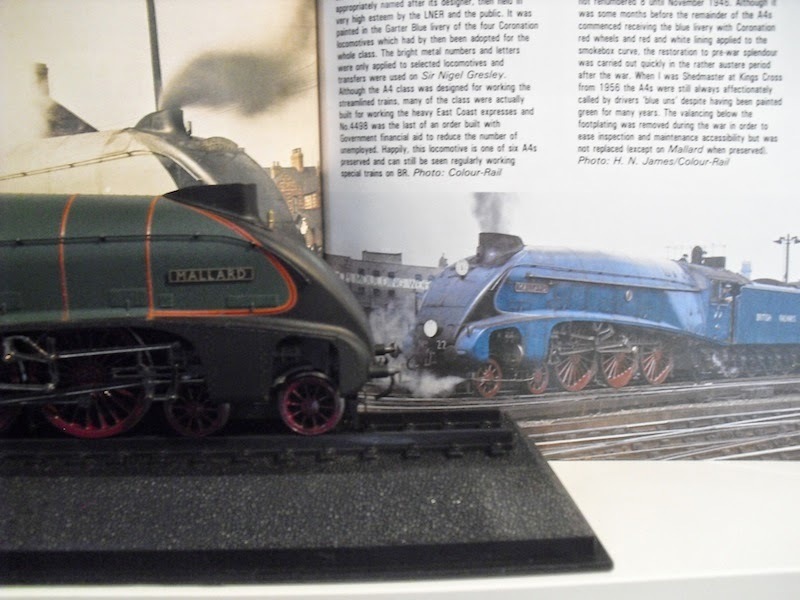 This one is based on the Hornby Railroad A4 model, which funnily enough is of Mallard herself. This conversion requires new valve gear (super detail set from eBay) and new cylinders (super detail, from eBay) and though costing more in terms of the modifications to the chassis, actually in effect requires less work and effort to get to this stage than the Great British Locomotives A4 models. 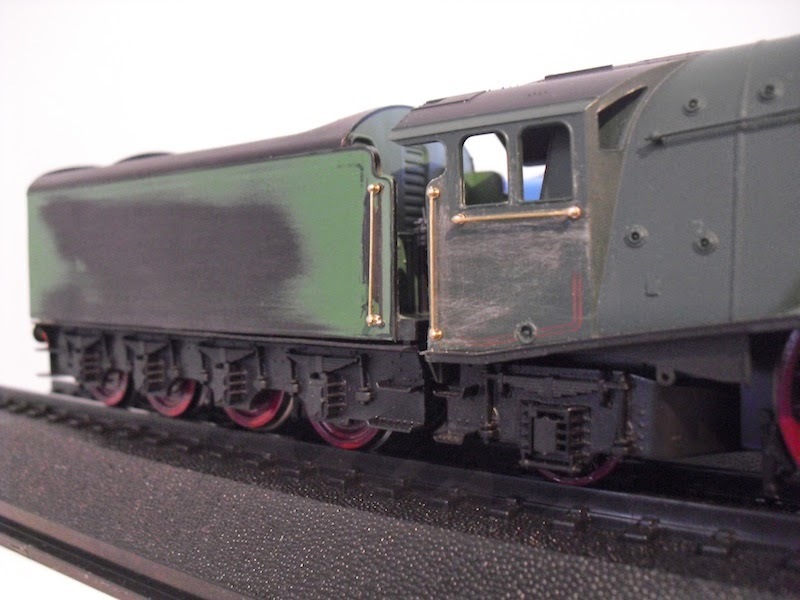 Since this already has the valances cut away, it was just a matter of removing the moulded handrails on the cab and fitting new brass ones, and replacing outright the ancient tender drive tooling that Hornby bizarrely brought forward to produce with their new Railroad model. That is literally it aside from the same repainting that we saw with Silver Fox earlier in the year (though I will have an interesting blog on that soon). Lining up my three prototype A4 conversions makes an interesting case study. 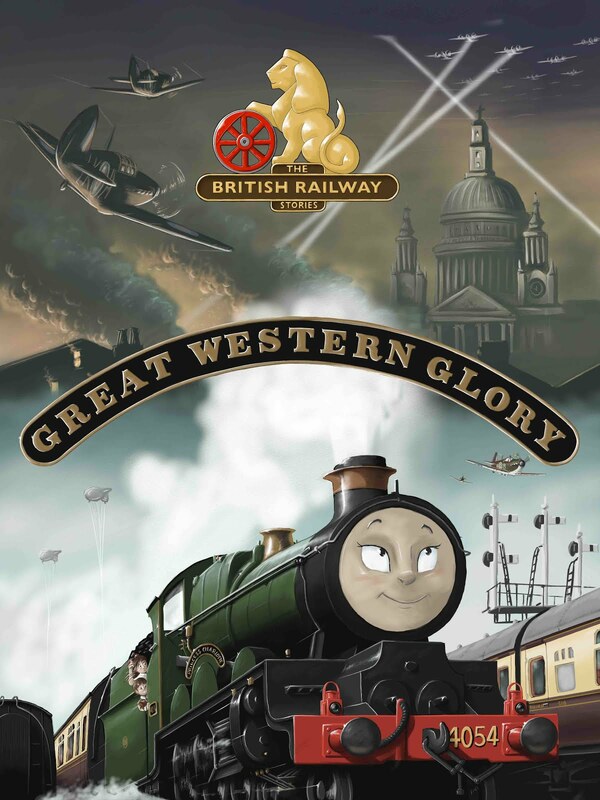 On the extreme right, no.17 Silver Fox, which was the first and is a GBL body shell on a Bachmann chassis with a Hornby/GBL hybrid tender. In the centre, what will be no.8 Dwight D. Eisenhower, following loosely the same method as Silver Fox but with the non corridor streamlined tender. 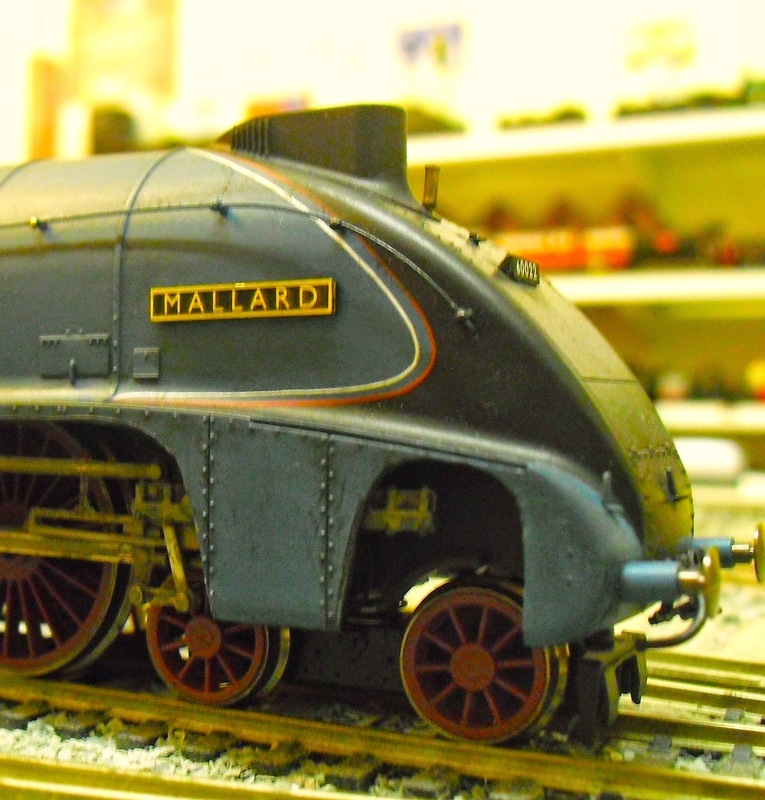 Then of course, we have what will be no.E22, Mallard for contrast. 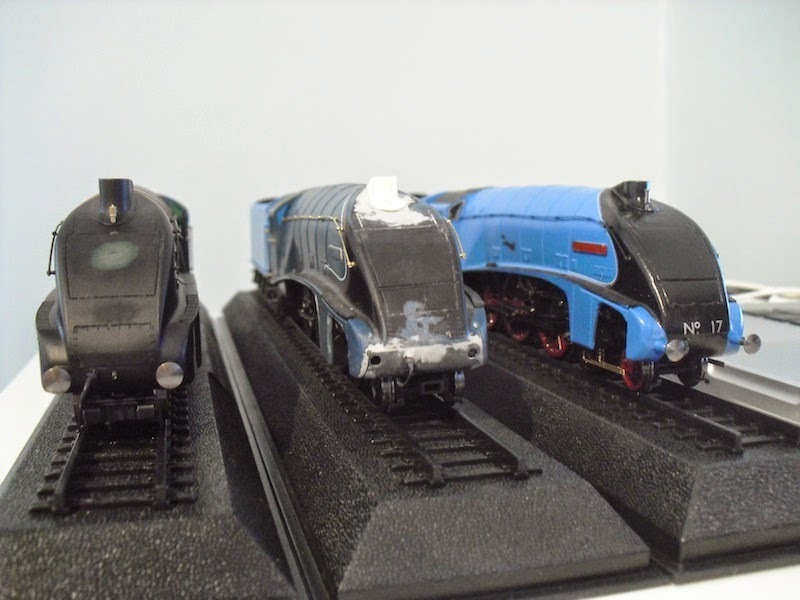 The big difference between the three models is in the front end: resin chimney and after market buffers make Silver Fox look rather different to the Hornby model, despite being of the same locomotive class. I'm leaning towards the Railroad model again at this point, because not having to cut away valances is something of a relief. But the cost of replacement valve gear and cylinders puts the overall conversion project for a Railroad A4 above that of the my cheap £3 GBL body shells plus whatever Bachmann A4 chassis I can get my hands on, second hand from eBay. I hope I can emulate this photograph, seen in one of Peter Townend's excellent volumes (I thoroughly recommend picking up The Colour of Steam, Volume 4, if you like Gresley Pacifics and have a penchant for late British Railways steam.